It was launched in the United Kingdom in March 1981 as the successor to Sinclair’s ZX80 and was designed to be a low-cost introduction to home computing for the general public. It was hugely successful and more than 1.5 million units were sold before it was eventually discontinued. The ZX81 found commercial success in many other countries, notably the United States, where Timex manufactured and distributed it under licence and enjoyed a substantial but brief boom in sales. Timex later produced its own versions of the ZX81 for the US market – the Timex Sinclair 1000 and Timex Sinclair 1500. 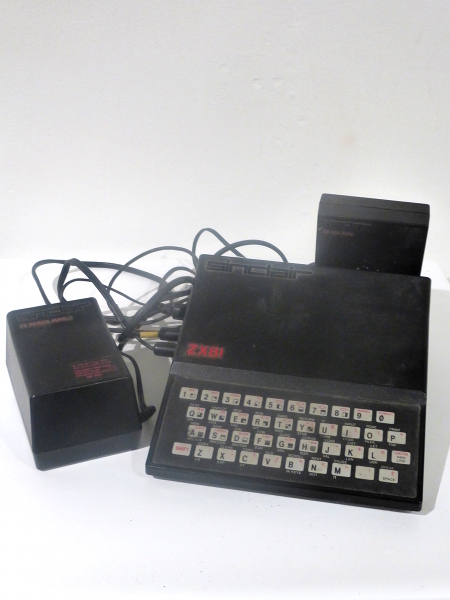 Unauthorised clones of the ZX81 were produced in a number of countries. The ZX81 was designed to be small, simple, and above all cheap, using as few components as possible to keep the cost down. Video output was to a television set rather than a dedicated monitor. Programs and data were loaded and saved onto audio tape cassettes. It had only four silicon chips on board and a mere 1 kB of memory. The machine had no moving parts – not even a power switch – and used a pressure-sensitive membrane keyboard for manual input. The ZX81’s limitations prompted the emergence of a flourishing market in third-party peripherals to improve its capabilities. Such limitations, however, achieved Sinclair’s objective of keeping the cost of the machine as low as possible. Its distinctive design brought its designer, Rick Dickinson, a Design Council award. The ZX81 could be bought by mail order in kit form or pre-assembled. In what was then a major innovation, it was the first cheap mass-market home computer that could be bought from high street stores, led by W.H. Smith and soon many other retailers. The ZX81 marked the first time that computing in Britain became an activity for the general public, rather than the preserve of businesspeople and electronics hobbyists. It inspired the creation of a huge community of enthusiasts, some of whom founded their own businesses producing software and hardware for the ZX81. Many went on to play a major role in the British computer industry in later years. The ZX81’s commercial success made Sinclair Research one of Britain’s leading computer manufacturers and earned a fortune and an eventual knighthood for the company’s founder, Sir Clive Sinclair. Video about an inconic dog. Made by Michael Scott.